How you treat yourself and your body? How do you try to motivate yourself to go out and play sports or go on a diet? Do you look at yourself in the mirror and shame yourself with the worst possible words? Self-criticism dictated by self-hatred and shame, but trying to force yourself to do something? These approaches threaten endless weight fluctuations, constant anxiety and frustration to oneself, and injuries from training. When losing weight, you try to lose more weight by playing sports, you will push yourself to the max, but won’t get satisfactory results, you will always feel unhappy. However, there are tips that will help you become well-balanced and will help you lead yourself in a better path, without creating endless stress. 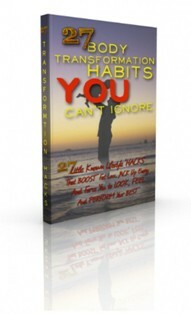 You can find them in the book 27 Body Transformation Habits You Can’t Ignore. Enough growing fat! It’s time to change your body for the better. Thinking about how much you “should” weigh how fast you “should” run, how strong / slim / toned you “should” be only creates discontent. Being embarrassed of your own body will make you more likely to give up exercising or work out with such determination and bitterness that you may just hurt yourself. The understanding of what stage you are at will help you approach workouts consciously, with compassion to yourself and satisfaction. Stop comparing yourself to others or even to yourself five years ago. Comparison steals joy, since it leads to a smug admiration or to a sense of inadequacy and shame. And you already know that shame kills motivation. And at this particular moment of your life you have a unique opportunity, admit it, open your eyes and realize how amazing life still is. An excellent first step will be to start a media diet. Get rid of magazines that promote ridiculous ideals of beauty. Naturally, realize that even the models in the photos look absolutely perfect, their beauty is brought on by the ideal by using a whole arsenal of means, including photoshopping the image in a photo editor, but you subconsciously still keep these images and it slips in your mind for which you should strive for. The less you are surrounded by photos, which you could compare yourself to, the better your mental state will be. It is even necessary to abandon magazines about health and fitness, as they ultimately bring too much attention to paid inflated pictures of women and men, and there again, your subconscious is working against you, forcing you again to feel ashamed of your body.